Do we know enough right now to stop the suffering immediately and to stop denying that we don't really know what animals want and need. Yes, we do. I'm surely not against philosophizing and conjuring up different scenarios, but it's time to pay attention to what we know about the cognitive and emotional lives of other animals supported by solid empirical research, and to use this information when we ponder how we should and should not treat other animal beings. Last week I received numerous emails about an essay published in the New York Times by Rhys Southan, a former vegan, called "The Enigma of Animal Suffering." Here, I just want to call your attention to this essay and also provide come comments because there are some conclusions Mr. Southan draws that are questionable based on solid evolutionary theory and detailed empirical research. To date, his essay has received 885 comments, and they contain much of what I mention below and much more. Mr. Southan's essay begins, "One of the most provocative tactics used by opponents of animal exploitation is to draw an analogy between human and animal suffering." While provocative and interesting, this tactic really isn't all that important in arguments about why animal exploitation is unethical and morally questionable. And, from an evolutionary point of view using Charles Darwin's ideas about evolutionary continuity, it's not all that sound. I've written about this in many different places, namely, that we need to look at the world of an animal from his or her own point of view, and solid theory and a plethora of solid data support that nonhuman animals (animals) do what they need to do to be card-carrying members of their species. They don't have to do what we do nor feel what we feel to be granted the right to a good life. So, while the suffering of cows, pigs, sheep, chickens, and other food animals might not be the same as ours or the same across species, this is not at all surprising and does not mean that they do not suffer in their own ways. Indeed, all mammals share the same neural apparatus and neural chemicals that underlie their emotional lives, so let's stop pretending that their suffering isn't as real for them as ours is for us. We accept that prelinguistic humans suffer, so not being able to say that this or that causes pain isn't enough to conclude that we don't know that other animals really suffer. They tell us they suffer physically and emotionally in many different ways, and anyone who's been around other animals knows this. We also need to stop pretending that we don't know what other animals want and need. Of course we do -- they want to live in peace and safety just like we do. And, many scientists agree, and the number is growing, that consciousness and sentience are widespread in the animal kingdom, more so than previously thought, so it's not rocket science to conclude that other animals experience what we do in their own ways (please see "Scientists Finally Conclude Nonhuman Animals Are Conscious Beings" and "A Universal Declaration on Animal Sentience: No Pretending." And, of course, there are also individual differences among members of the same species, just as there are among humans. These individual differences in personality are incredibly fascinating and challenging to understand in nonhumans and humans. So, while cows may suffer differently from pigs, for example, individual cows likely suffer differently as well. Along these lines, Mr. Southan writes, "Our perception of the external, of disturbing images or scenes, is sometimes a projection of our own feelings as observers; it does not match what the subjects of such treatment actually experience. Animal slaughter, for instance, looks gory and disturbing, but when the animals are knocked insensible first, the discomfort is our own — not theirs. For human analogies to animal farming to have force, the experience of being a farmed animal should be equivalent to the human experience in superficially similar circumstances. Is it safe to assume that a cow raised for food suffers the same general humiliations, agonies and frustrated drive for freedom that a human slave or victim of sexual assault or genocide does? 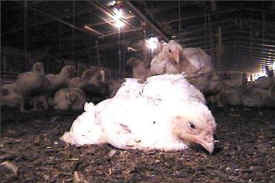 If not, arguments equating animal suffering to human suffering are logically flawed." Just because Mr. Southan feels that "arguments equating animal suffering to human suffering are logically flawed" does not mean that other animals do not suffer in their own ways (see for example, "Do "Smarter" Dogs Really Suffer More than "Dumber" Mice?"). A cow most likely does not suffer "the same general humiliations, agonies and frustrated drive for freedom that a human slave or victim of sexual assault or genocide does", but this is irrelevant. The cow suffers as a cow suffers, and not necessarily as a pig, lamb, or human suffers. And, frankly, I don't know what he means when he writes "the experience of being a farmed animal should be equivalent to the human experience in superficially similar circumstances." It's biologically incorrect to argue for equivalance within and among different species, so comparing the experiences of nonhuman to human animals is fraught with difficulties, and the word "superficially" is far too vague. Do animals know they are going to die and does it matter? Mr. Southan also considers a number of other areas that are used to justify meat eating. He cites Dr. Temple Grandin who claims that animals don't know they are going to die. While this may be so, we really do not have any detailed evidence that animals do not know they are going to die, including Dr. Grandin's rather casual observations. And, once again, it's irrelevant to the argument that it is wrong to exploit other animals in the ways that "food animals" and others are routinely and brutally mistreated. Mr. Southan writes, "If we can take animals to their deaths without their ever connecting the dots, then with the best animal farming the existential angst over their being exploited and doomed is almost certainly in our heads, not in theirs." Even if this assertion was true, so what. We are still unnecessarily taking a life for our own good and this does not mean the animals do not suffer along the way. Of course they do, and solid science shows that numerous other animals are sentient beings who endure deep suffering in many of the venues to which we subject them. Indeed, Dr. Grandin would have to agree, as she is world renowned for trying to make the lives of "food animals" "better" by walking along what she calls her "stairway to heaven" so they suffer less on their way to one's plate (please see "My Beef With Temple Grandin: Seemingly Humane Isn't Enough"). And, "better" does not mean "good enough" or marginally acceptable. Is living a short and "happy cow life" good enough? I encourage you to read Mr. Southan's essay and think about it deeply. I've considered many of his arguments and assertions and countered them in an essay called "Dead Cow Walking: The Case Against Born-Again Carnivorism." For example, I do not believe that living a short and "happy cow life," only to be killed -- double-crossed -- by those who supposedly love you, is better than no life at all. Mr. Southan appeals to the ideas of Greek philosopher Epicurus and Lucretious, his Roman protégé, to argue "it doesn’t seem cruel to breed animals into existence even while intending for their lives to be brief." I bet most people who share their homes with dogs, cats, and other companion animals would strongly disagree. And, of course, cows and other food animals are no less sentient than our household companions. So, I don't think that animal suffering is much of an enigma at all, and surely no more than human suffering. Is there more to learn? Yes, there is. Do we know enough right now to stop the suffering immediately and to stop denying that we don't really know what animals want and need. Yes, we do. I'm surely not against philosophizing and conjuring up different scenarios, but it's time to pay attention to what we know about the cognitive and emotional lives of other animals supported by solid empirical research, and to use this information when we ponder how we should and should not treat other animal beings.